15 inch high and 12 inch wide makes it perfect very well to be seen by any adult or kid you want to prevent from entering. DURABLE RUGGED: The best part is that it holds up very long and lasts through all weather and conditions, it's durable and sturdy in winds or storms and, of course, it's very easy to install with minimal effort. EASY INSTALLATION: Unlike cheaper stake signs, once these are installed, they cannot easily be removed by vandals. FULL SAFETY: 'Private Property No Trespassing' sign is large enough to stand out. Can easily be seen by any adult or kid who wants to cross the line. 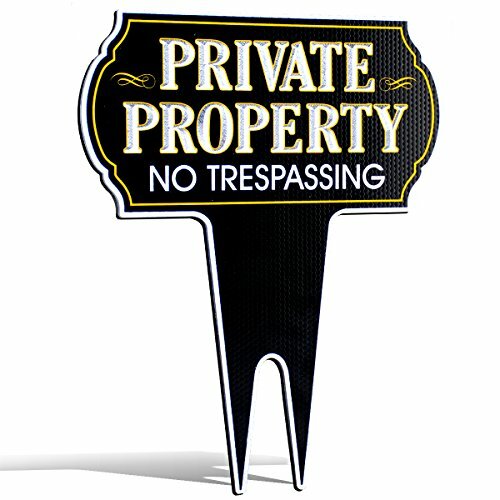 APPROPRIATE SIZE: We have carefully designed the 15x12 inch size of this Private Property No Trespassing sign considering every aspect. This unique size gives the ability for the wording to stand out and be easily understood. CLEAR WARNING: Our Private Property No Trespassing Metal Yard Sign is reflective so it will be sure catch the attention of possible intruders. View More In Outdoor Décor. If you have any questions about this product by Signs Authority, contact us by completing and submitting the form below. If you are looking for a specif part number, please include it with your message.